Kosie House of Theatre turns 10 and celebrates with BIG news! Passionate about theatre to the extent of having a piece of theatre written for him, which he performed on a professional stage, so that he would have an idea of what the “actor” experienced, Kosie Smit of KOSIE HOUSE OF THEATRE, celebrated 10 years of producing great theatre with the launch of a six-month season of Afrikaans shows at Pieter Toerien’s Studio Theatre at Montecasino. The announcement was made today at a glamorous function held at the very theatre where this trailblazing season of shows is to take place, The Studio Theatre. Thanking Mr Toerien repeatedly for his belief and trust in him, Kosie announced the shows that make up the season. Those in attendance were also treated to the hilarious opening song from the first of the five show line-up, ALTYD IN JOU DROME performed by Michelle Botha, Neels Clasen and Andre Lotter. Kosie has always managed to attract the ‘cream of the crop’ to work for him, legends like Sandra Prinsloo, Tobie Cronje, Lizz Meiring, Marion Holm, Andre Odendaal and young, up and coming stars like Michelle Botha, Andre Lotter, Neels Clasen, Willem Botha, Tessa Denton, Hanna Grobler etc, all who will or have made appearances on our stages. The passion for theatre and Afrikaans theatre, in particular, being the common driving force. 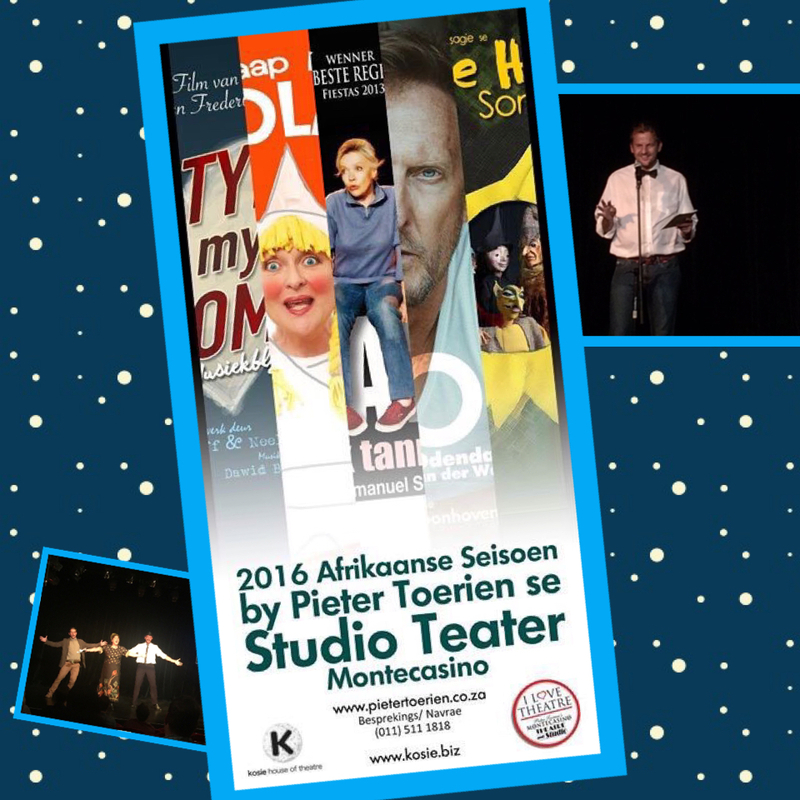 Pieter Toerien Productions are proud to be associated with Kosie House of Theatre and we look forward to this new and exciting collaboration. Both producers’ demand for excellence will assure that “World Class Theatre” will always be the name of the game.